Luxuriously appointed cabin, above-average passenger and cargo space, good ride and handling balance, widely available all-wheel drive. Not as quick as many rivals, controls can be fussy, convertible employs previous-generation platform. Audi’s entry-level sedan and companion Avant wagon get a complete redesign for 2009. The new A4 is longer and wider, resulting in more interior room and cargo space. The optional Drive Select system allows the driver to customize steering, suspension and transmission settings, and a rearrangement of the front axle has yielded a less-nose-heavy weight distribution. New technology features include direct injection for both engines, adaptive cruise control, a blind-spot warning system and a revised version of Audi’s MMI systems controller. The convertible A4, however, carries over from last year. Despite being a longtime top seller in Europe, the Audi A4 has historically trailed a distant 3rd behind those other German automakers’ compact luxury sedans in the North American market. 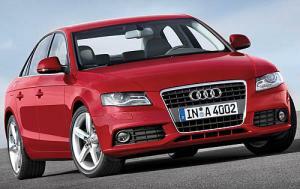 The folks in Ingolstadt are hoping to change all that with the newly redesigned 2009 Audi A4. The new A4 sedan is nearly 5 inches longer and 2 inches wider than the previous model, which yields more headroom, more shoulder room and an additional 1.4 inches of rear knee room, as well as class-leading trunk space. Also new on the A4 this year is a pair of direct-injection engines — the standard 2.0-liter turbocharged four-cylinder and an available 3.2-liter V6 (sedan only). The 2009 A4 additionally offers a plethora of techno-gadgets, including radar-based adaptive cruise control, a new park distance control system and revised controls for Audi’s Multi Media Interface (MMI) system. Driving enthusiasts will appreciate that the drivetrain’s AWD layout has been adjusted to improve weight balance for better handling. In addition, the optional Drive Select system permits the driver to adjust ride compliance, steering effort and shift response — there are three different preset modes as well as a personalized mode where you can mix and match settings. Of course, the 2009 Audi A4 faces stiff competition, such as the more engaging BMW 3 Series, the affordably priced Infiniti G37 and the solidly built Mercedes-Benz C-Class. Since the convertible A4 is a carry-over from the previous generation, we’d definitely hold out for the upcoming A4-based A5 and S5 convertibles. But for those in search of a good-looking and sharp-handling compact luxury sedan or wagon with AWD and the latest technology features, the 2009 Audi A4 is a solid choice.